I have just spent a few weeks back at home in England sorting through a load of old belongings. What could be a quick clearing out task is often halted and slowed by sentiment and nostalgia and I would spend a long time reading over old, excruciatingly embarrassing diary entries, or cringing at pictures of my teenage self, or critically examining my old university and school work. 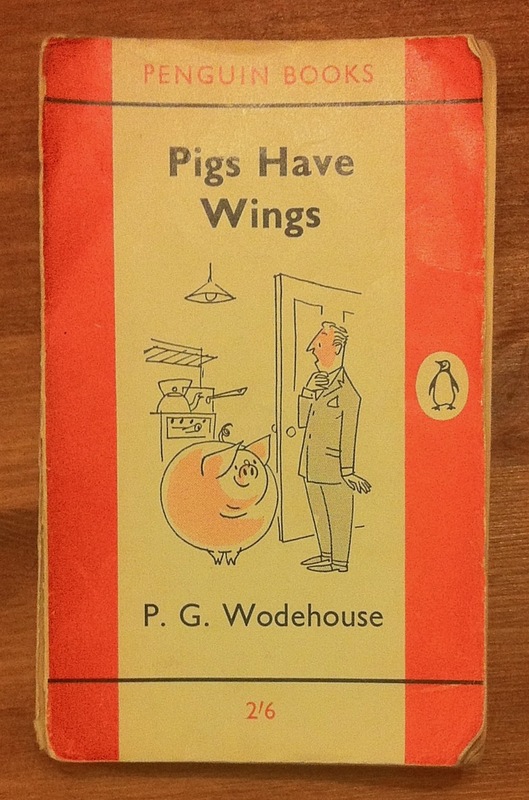 In the many piles of old exercise books I found a book review of a P. G. Wodehouse paperback I had been reading during the summer holiday in Scotland (according to my diary:”Still reading Pigs Have Wings.” That was a toe-curlingly thrilling entry). I was 13 at that point so I decided to read the book again to compare reviews 13 years on, once I stopped hyperventilating about the fact that I wrote this HALF MY LIFE AGO! ‘Pigs Have Wings’ is set in the countryside, outside London. The main setting is Blandings Castle where Lord Emsworth lives. He is competing with Sir Gregory Parsloe for his pig, Empress of Blandings, to gain the “Fattest Pig” award in the local show. Most of the characters are aristocrats and the novel makes a mockery of English aristocracy. It is quite a funny book, with a lot of confusion between characters when they always seem to grasp the wrong end of the stick. A lot of engagements are made and broken, sometimes it is hard to keep up with them. At one time there are about two or three story lines interlocking but the basis of the story is the two pigs. Because of the immense competition Gregory Parsloe steals the Empress of Blandings and Lord Emsworth steals the Pride of Matchingham! Lord Emsworth is pretty crazy and pompous and gets everyone annoyed. He will always deliberately say he has not a clue what his companions are talking about when they know that he does understand. He does not work properly but has a very busy lifestyle. Galahad ‘Gally’ Threepwood, Lord Emsworth’s brother, is a likeable character as he’s a bit of a joker. He helped plot the capture of the Pride of Matchingham. Although he is always willing to help out, he is not the person you would entrust secrets upon- one of his hobbies is telling stories. I found myself getting wrapped up in this book. It was frustrating at times when the characters did not find out all the details of scenarios and acted off only the few details they knew about. It is also frustrating when you know they are engaged to the wrong person and want them to realise that. In the end it is re-arranged and all there is to worry about is the pig contest. I would recommend this book as a light read if you need cheering up. It takes a while to get used to but in the end it is an enjoyable read. Copy of Pigs Have Wings: 2 and sixpence. Finding a prize pig in your kitchen: Priceless. I have to say I haven’t really much to add to this review, though I am not suggesting it is the most enlightening book review I have ever read. I obviously didn’t understand all the humour at that age, and I probably had no idea about why Lord Emsworth ‘does not work properly’ but it seems like I had a grasp of the gist of the book and I enjoyed it as much now as I did then. Of course it is not a novel with an extremely hard hitting theme or many deep issues, but it is an absurdly funny serving of situation slapstick with healthy dose of tongue in cheek lifestyle advice. Posted in Reviews and tagged Blandings, book review, humour, Literature, nostalgia, P. G. Wodehouse, paperback. Bookmark the permalink. He has left behind a treasure trove of unblemished humour which sparkles inside us and illumines the soul.